28/3/2019: JE/AE/Driver/JSA/ JLM Posts available for online application right now. Karnataka High Court Stay order on Assistant Executive Engineer (Elec.) in KPTCL & ESCOMs remaining posts available but online application facing some issues. Online application available officially check revise application dates notification here. Due to Technical Reasons KPTCL Postponed receiving applications for JE /AE/ AEE. they will inform revised dates. maybe available from 20/3/2019. KPCL (karnataka Power Generation Corporation) Not KPTCL also release notifcation medical,accounts,safety officers last date 20th April 2019 apply from 20/3/2019 at karnatakapower.com. KPTCL AEE 2016 -17 Merit list announced in March 1st week. if server gets busy please try again later. KPTCL February 2019 notifcation released for 3646 JE & other posts. Apply online from 5th march 2019.
last date 4/4/2019 . Notifice , Online application available from respective websites. Qualification: 10th class / SSLC. For Category wise: IIA, IIB, IIIA, and IIIB Maximum 38 years. 0.25 Negative Mark for 1 wrong answer. Maintaining equipment & keep a record. Assist in charge of checking the installations. Any other work allotted by superiors. kptcl junior station attendant syllabus is same as Junior Linemen. Application Process: For KPTCl online application, visit http://www.kptcl.com/, fill The application details & upload documents. Download Notification dated 28/3/2019 here. Candidates visit the website of KPTCL www.kptcl.com. After that, click on the link of KPTCL Openings 2019. Now start filling the application with details finally Click on submit. Upload your photograph and signature, Certificates. Also completes part 2 registration of KPTCL Recruitment. online application link present not working we will update ASAP. latest official announcement for KPTCL NNK here. Not working, however if any applied for the AE / JE Posts please let me by commenting below. In the official Advertisement stated that application available at Regional website as(BESCOM,GESCOM,CESCOM as mentioned above). but there is same portal for online application here is http://nemaka.kar.nic.in/escoms_2019/. Framed in 1st August 1999. The Karnataka Power Transmission Corporation Limited has 24 power stations and 34 dams across the state. BESCOM (Bangalore Electricity Supply Company Limited). KEB Recruited 1921 vacancies for AEE, AE, AAO, JE, Assistant, JA in September 2016. 6213 Junior executive with any degree in August 2016. 8080 Junior station Attendant & Junior Linemen vacancies in November 2015. 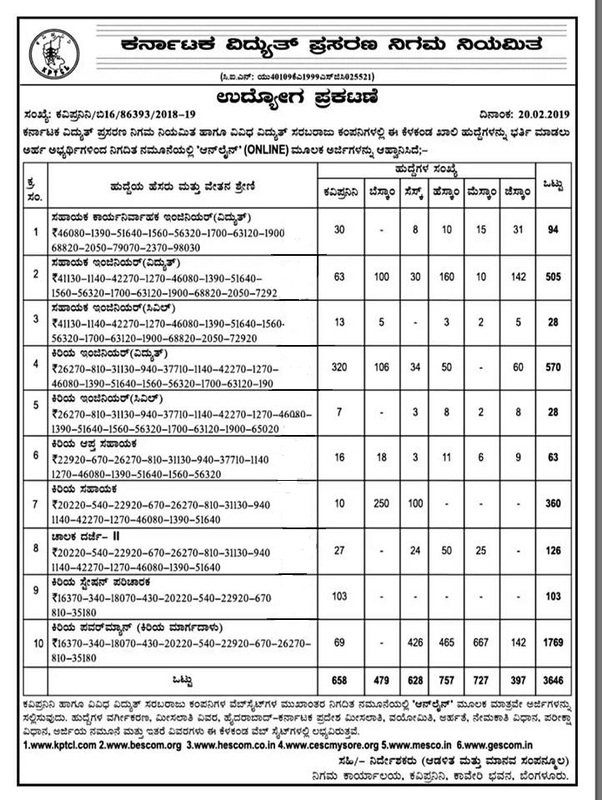 912 Engineering jobs filled by Karnataka Power Transmission Corporation Limited Recruitment KPTCL on April 2015.
so there is no notification from 2016. but kptcl going announce huge vacancies in 2108. be ready for it. How to do download Karnataka Power Transmission Corporation Limited Admit Card 2019? Enter your JUnior Asst engineer Exam application Login details or Application number & DOB. Finally, view The KPTCL AE / JE Admit Card 2019 and verify the following details. Details to verify on the KPTCL AE / JE exam Admit Card? Check the Exam date & timings on Karnataka Power Transmission Corporation Limited Admit card. Verify the KPTCL AE / JE examination center along with your photo & signatures. Don’t’ forget to check your name & father name on KPTCL AE / JE Admit Card. Carry a valid Photo ID for KPTCL AE / JE Exam 2019. KPTCL AE / JE Exam date (tentative) >> Tentatively scheduled on – or within 15-30 days after the admit card release. How to Check KEB AE / JE Results 2019? Official KPTCL AE / JE Results Available on. http://www.ossc.gov.in. Enter your Junior Asst engineer exam Application Login details (Application number / DOB). Finally, view The KPTCL AE / JE Results 2019 and verify the following details. Details to verify on the Junior Asst engineer exam Results? Check Topic wise Karnataka Power Transmission Corporation Limited Results. Don’t’ forget to check your name & father name on KPTCL AE / JE Results. Read instructions carefully printed backside of the Junior Asst engineer Results 2019. KPTCL AE / JE Results release date (tentative) >> Available soon. Last date 19th March 2019.
download notification . application process offline. Follow latest Government Jobs in Karnataka. follow all latest & upcoming Karnataka state government jobs here. When application start sir for the junier linman post ????? All poor people waiting this job.plz stop your fake information…..
its maybe fake but its upcoming please look at qualification and syllabus details and prepare well. Station attendant and Line man post no need any basic training certificate, Current work right, SSLC guys think family not a job or take any safety training, Government think only benefit. When JLM recruitment application is started sir /mam. I am waiting for this job.